Text: Psalms 69:6-70:8 (recto). 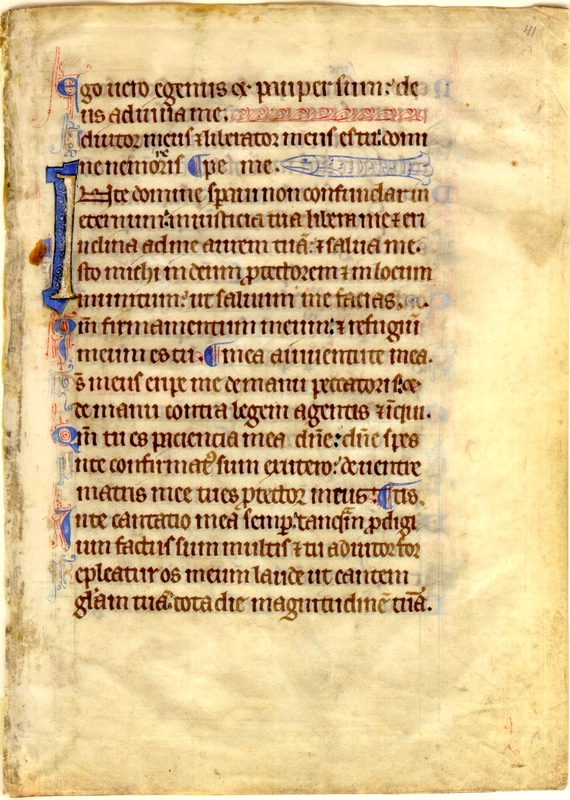 A scan of the verso is not currently available, but it likely contains the text of Psalms 70:9-18. Ego vero egénus et pauper sum; Deus, ádjuva me. Adjútor meus et liberátor meus es tu; Dómine, ne moréris. Inclína ad me aurem tuam, et salva me. Quóniam firmaméntum meum et refúgium meum es tu. Quóniam tu es patiéntia mea, Dómine; Dómine, spes mea a juventúte mea. In te cantátio mea semper. Tamquam prodígium factus sum multis; et tu adjútor fortis. Repleátur os meum laude, ut cantem glóriam tuam, tota die magnitúdinem tuam. In thee, O Lord, I have hoped, let me never be put to confusion: 2 deliver me in thy justice, and rescue me. Incline thy ear unto me, and save me. 3 Be thou unto me a God, a protector, and a place of strength: that thou mayst make me safe. For thou art my firmament and my refuge. 4 Deliver me, O my God, out of the hand of the sinner, and out of the hand of the transgressor of the law and of the unjust. 5 For thou art my patience, O Lord: my hope, O Lord, from my youth; 6 By thee have I been confirmed from the womb: from my mother's womb thou art my protector. Of thee shall I continually sing: 7 I am become unto many as a wonder, but thou art a strong helper. 8 Let my mouth be filled with praise, that I may sing thy glory; thy greatness all the day long.